National and state park museums commonly include rotating artwork exhibits, which require careful storage and display as any other collection. We have a variety of artwork collection storage solutions available to buy online for your convenience. Unfortunately, most paintings are extremely delicate, and a variety of factors contribute to eventual deterioration. Proper storage and handling go a long way toward keeping paintings preserved for the long term. During storage, curators must protect artwork from multiple damaging factors such as light, pests, and improper handling. By practicing preventative conservation, curators avoid costly and time-consuming treatments. Whether storing a high-dollar art collection or sentimental works that you’d like to display in the future, think about where to keep everything. Then, test the area’s average humidity to ensure it’s moderate. Use somewhere cool and dry that doesn’t exceed 70 degrees, rather than moist spaces. Changes in temperature can cause materials to expand and contract, leading to damage and deformation. This could include wrapping, discoloration, and mold growth that take time and money to eliminate. When in doubt, dark and windowless environments provide the safest long-term preservation conditions. Wipe away any unsanitary dust or dirt that could compromise the paintings’ integrity during this time. Use soft, fresh microfiber cloths rather than harsh products to clean framed work. You can spray wood or metal frames and sculptures with a quality polish, too. Framed items should have cardboard corners to protect it and the structure. Then, place supportive padding such as bubble wrap around the entire work. Secure the layer in place with tape or string. To ensure items have added dust and moisture protection, wrap them in breathable material. Avoid rolling unframed works such as canvas paintings. Despite being an easier and cheaper technique, experts advise against it. If rolled up too long, it could have permanent creases and cracks in the paint. Wrap these in air and water-resistant material and secure them between sturdy foam or cardboard. Then, put it in a protective bag made from breathable material to prevent deterioration due to dust and moisture damage. The safest way to position artwork collections during storage depends on the medium. Read on to learn the proper techniques when handling a few specific works. To prevent damage, national and state park museums should place framed works in a standing position rather than one on top of the other. Pieces could collapse from the stress of their own weight if stacked. Unframed works can withstand stacking, but experts recommend storing these works in a standing position too. You can store small box or paper works in drawers but must check for termite and acid secretions first. Everyone from national and state park museums to libraries, historical societies, airports, and more should document and photograph artwork collections in storage and on display. As an actual record, it serves as a good reference in an emergency or if a theft occurs. It can help streamline insurance claims if you need to file one. To simplify the process, create a spreadsheet with details about the works being stored and label everything accordingly. Artwork collection storage continues to challenge cultural centers around the world, including national and state park museums not as well known to the public. Many lack the space to store growing collections and only display about 5% of them at any time. The rest remains hidden in areas that the public cannot access, such as off-site facilities (which cost a pretty penny to rent). Needless to say, it can often place further strain on departmental budgets. To compensate, museums mainly store paintings by hanging them from storage screens, placing them on shelves, or stacking them vertically. It’s more affordable and increases audiences’ exposure to displayed collections. What works best for you depends on the size and environment of your storage area. Made from sanitary and durable construction, the artwork collection storage can accommodate more than national and state park museums. This includes airports, historical societies, and libraries that display artists’ work. All can depend on the versatile solutions to save space while keeping displayed art organized and safe. Users can adapt many along or right to an empty wall to maximize underused space. Some span floor to ceiling to promote better vertical space use. Another occupies the entire perimeter to ensure optimal footprint efficiency. Others fit counter-high bases that require minimal use of the floor to accommodate static cabinets with a space-saving compact design. Sanitary wire carts have the flexibility to relocate and save space in moments. Personnel then has safe access to the area and can reuse it to accommodate other productive activities. This includes wedding receptions, concerts, family-friendly programming and more. Other contemporary options such as pull-out racks retract in and out of the aisles to provide users more versatile space savings. Without efficient funding to expand existing footprints, staff must find creative ways to execute proper preservation practices within the available space. You can find some affordable artwork collection storage options safe enough to use in national and state park museums online. As efficient space-saving solutions, all can organize and protect rotating exhibits from deterioration, helping increase the lifespan. Read on to learn how the budget-friendly systems stack up against one another. Available in wall-mounted or freestanding configurations, wire mesh panels provide proper storage and easy viewing at the same time. Freestanding options allow users access to two screens with space to display more in the same footprint. It promotes better capacity efficiency while allowing patrons more visible access to collections. Systems with wall-mounting capabilities hang high off the floor to save space that facilities can reuse to accommodate more productive activities. 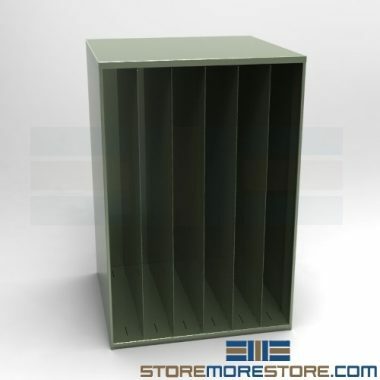 All have a non-reactive solvent-free powder coat finish durable enough to protect pieces against environmental factors. Configurations have a sturdy, perforated design that provides efficient and clean airflow to keep everything on display dust free. Freestanding options allow independent use to prevent interference with optional art hooks. Curators have more than enough space to organize and secure collections in the available footprint and save on storage costs. Patrons enjoy twice the visible access to rare pieces often hidden from public view, too. 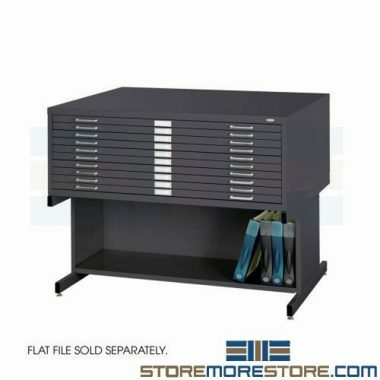 Prevent damage from rolling or folding and store plan drawings, graphics, maps, drafting documents, blueprints, vellum sheets, and oversized documents by storing them in flat file cabinets. Closed compartments have no space in between one another, promoting maximum capacity usage within the available footprint. It looks cleaner and more organized while helping keep dust and more out. Units are available with or without bases that have lower shelves to organize reference materials, helping simplify researchers’ work. Systems can accommodate optional components such as security key locks that provide efficient material tampering and theft protection. Label holders located on each drawer front help create instant organization. Configurations have ergonomic pull handles that allow users easier access to stored collections, helping simplify viewing. Stack systems weighing up to 2,000 lbs onto mobile bases if needing to relocate them due to limited space availability. It frees up the area to accommodate more productive activities. Personnel avoids injury while moving the heavy loads elsewhere in a more efficient timeframe and can do more during the day. Art tills organize framed and unframed artwork and protect them from light, pests, and deterioration. Users can stack the durable systems up to two high to maximize underused vertical space. 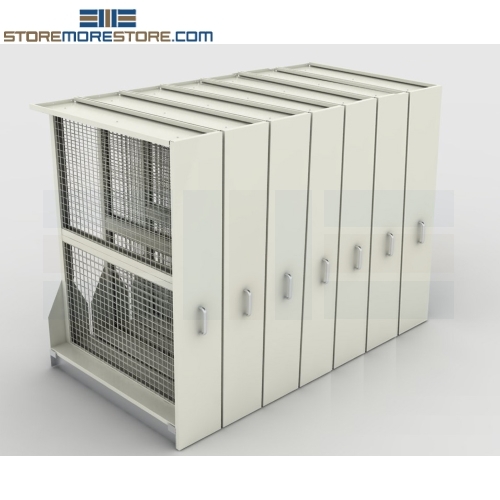 Units include adjustable dividers flexible and durable enough to protect stored works within the footprint. Users even have the option to remove the partitions if needing to create larger compartment widths. Models have a non-reactive solvent-free powder coating that safeguards items from harmful environmental factors. Systems’ open front provides efficient airflow to keep nonactive collections clean and in mint condition. 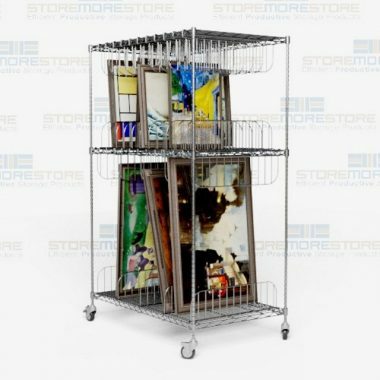 With adjustable dividers, these mobile space-saving framed artwork carts allow safe storage and transport for paintings. Flexible partitions allow users to customize the available space based on collection needs and keep everything upright to prevent damage during transit. Units have all-welded wire shelves versatile enough to provide airflow, light penetration, and more to keep items clean and visible. Users have comfortable access to stored collections from the rear and front, helping prevent damage and ensure safe handling during retrieval. Handlers can move the portable storage and everything it holds in moments to save space and simplify cleanup during exhibit rotation. Then, start redesigning the area to match new art installation themes and display stuff less often seen within the same footprint. Facilities expose audiences to more collections from within the available space and avoid an expensive expansion. 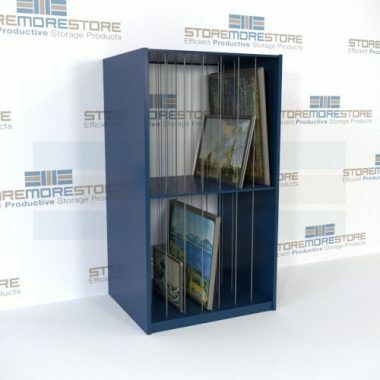 Pull-out art racks allow you to store artwork collections while saving space with retractable panels. The easy-to-install heavy-duty art racks anchor to floor without ceiling support. Units have a linear motion design that allows panels to slide out into aisles on an independent basis, leaving others undisturbed. Curators can hang works on each side during this time to ensure better space usage. Patrons must use the convenient and ergonomic pull handles if wanting visible access to collections on display. Staff can add extra panels in the future if needing more space to store growing collections. 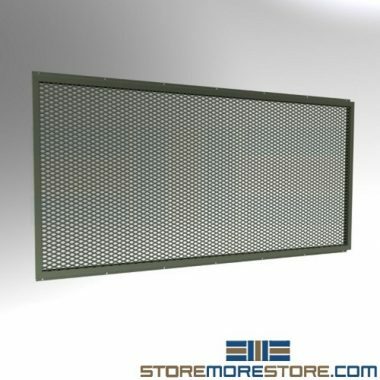 Screens have a sturdy perforated design that allows efficient airflow to keep everything from deteriorating during storage and while on public display. 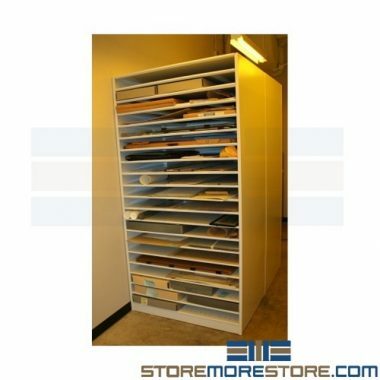 Works on paper shelving accommodates Hollinger boxes, Solander cases, maps, boards, posters, and other flat works with non-gassing material that protects stored collections. Units include adjustable shelves that users can adapt vertically to ensure efficient space use while keeping everything safe and organized. You can even add hinged doors with key or electronic locks that protect works from theft, dust, and more. Stand the static configurations against an empty wall to maximize vertical space efficiency. All have an open front large enough to provide efficient airflow and preserve the stored items integrity. Artwork collection storage units are available to buy online with free dock-to-dock shipping included. If you need any assistance or just want some help picking the right solution for you, please call us at 1-855-786-7667.